Up until today, you have been invited to several campaigns, boycotts, and mobilizations, or witnessed them; perhaps you even joined some of them. 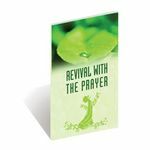 In this book readers are invited to a campaign which will save their lives both in this world and in the hereafter: to the Revival with the Prayer mobilization! Islam’s first obligation is to believe in Allah and the second one is to establish five daily prayers. In this booklet you will find why a believer should pay attention to this important act of worship based on the verses of the Qur’an and the sayings of the Prophet Muhammad as well as the views of several leading Muslim figures. Es ist noch keine Bewertung für Revival With The Prayer abgegeben worden.